Dean was born and raised in Wheat Ridge, Colo., and is a native of Colorado except for a three-year period when he lived in Bakers eld, Calif., and he began his career. He received his bachelor’s degree in petroleum engineering from Mines in 1977 and has spent his career working in the oil and gas industry. Dean is married to his high school sweetheart, has a son, a daughter and four grandchildren. Dean has an extensive background in nancials, fundraising for non-pro ts and a willingness to work on the behalf and for the bene t of others. He enjoys being a member of the Alumni Association Board and is honored to serve alumni in a capacity that benefits Mines graduates and the school. Brady earned a bachelor’s degree in petroleum engineering from Mines in 1978. While at Mines, he was president of Theta Tau fraternity and played football, lettering all four years and attaining All-Conference honors. Brady started his career working for Tenneco Oil Exploration and Production Company, serving in numerous disciplines, including offshore drilling, production and partner relations. He then started C2C Fiber Inc., in 1997, serving as president and CEO. In 2003, he founded Merrimack Oil and Gas before joining Venoco Inc., in 2007 as vice president of Texas Operations and Business Development. Brady co-founded Tabula Rasa Energy, a CO2 EOR company in 2010 out of Midland, Texas, and is currently pursuing a new startup in the Permian Basin with his company Yankee Creek. Brady lives with his wife and two children in Houston, Texas. Jonathan is a senior at Mines, pursuing a bachelor’s degree in environmental engineering with a minor in economics. When he is not working on schoolwork, he partakes in many campus activities. He is the student body president, a peer mentor and founder of the current Mines Water Polo team. He is also a member of the Acts of Random Kindness Society, helping boost campus morale and empowering his peers by bringing people together. Find full bios for board members online at minesalumni.com/board. Interested in getting involved with the alumni association? 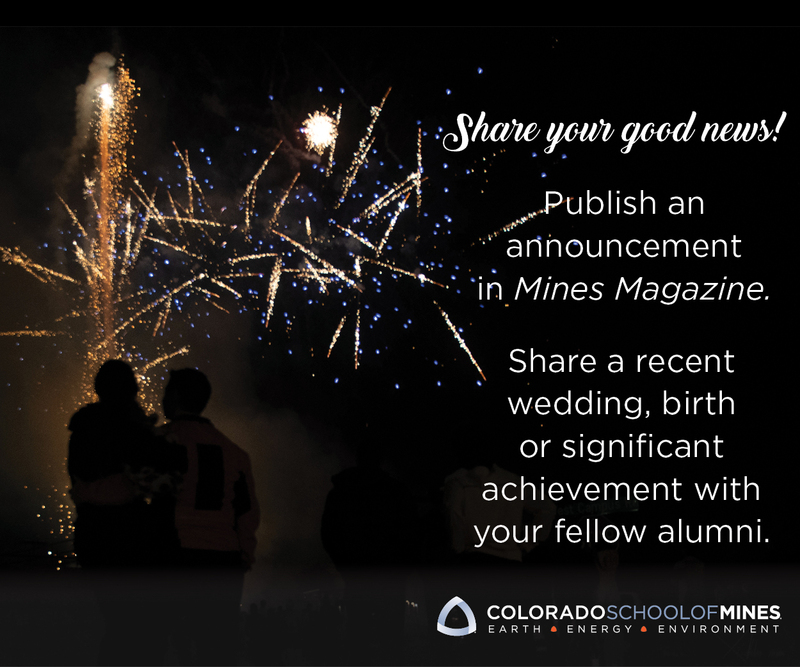 Learn about the opportunities at minesalumni.com/volunteer.